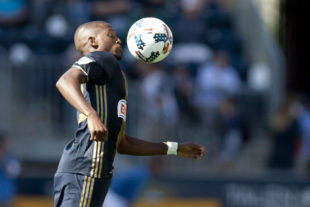 The Union beat the Sounders, 1-0, thanks to Fafa’s late goal, thus ending Seattle’s nine-match winning streak. They’re still in fifth place, one point behind Columbus. Phang’s on Twitter. It’s not following anyone. A side effect of getting struck by lightning? Penn FC lost to Louisville City FC, 3-0. In men’s soccer, the Villanova Wildcats were victorious over the LaSalle Explorers, 3-2. In girls soccer, Haddon Township started a busy stretch with a 6-1 win over Holy Cross Prep. At halftime on Friday’s match, Temple Men’s Soccer will honor the 40th anniversary of their 14-1-2 nationally ranked 1978 squad. With the Open Cup happening on Wednesday, U.S. Soccer did a Q&A with Curtin and Cabrera. The Open Cup trophy was at Houston’s City Hall as they prepared to say goodbye to it, since it’ll be in Philly a week from today. In other MLS play last night, the Portland Timbers beat Columbus Crew SC, 3-2, and Atlanta United snuck in a win against the San Jose Earthquakes, 4-3. Lee Nguyen has been embraced by L.A.’s Vietnamese community. In defense of Jason Kreis. MLS jobs that would appeal to coaches. North Carolina goes to the final with a 2-0 win over Chicago. In Campeones Cup action, Toronto FC fell to Tigres UANL, 3-1. It’s the money, Lebowski! A tearful Cristiano Ronaldo was sent off as Juventus defeated Valencia, 2-0. Real Madrid dominated Roma, 3-0. A tale of two Manchesters: United win and City lose. Life as a lower-league free agent once the season’s begun. Haven’t listened to it yet, but this podcast looks subscription-worthy. Union are now tied for second in MLS in road wins. What a difference from past years. What a difference from the first few months of THIS year! Does anyone know where I can buy that shirt? I dunno. Maybe tweet @selfee? Though I’m wondering if it’s homemade. My grandsons would love that shirt! !